We specialize in fire protection and suppression products and services for Stockton commercial kitchens, industrial facilities and restaurants. 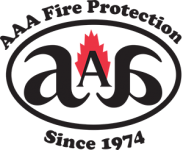 AAA Fire Protection Services has been in business since 1974, and in that time, we worked with thousands of Stockton customers. AAA Fire Protection Services offers grease exhaust cleaning services that are rated the best in the business. In addition to exhaust cleaning and filter exchange, we sells the best fire protection and fire suppression equipment, including sprinkler system design and installation, portable commercial fire extinguishers and cabinets, restaurant fire suppression systems, industrial fire protection systems and much more. Our technicians are always learning and improving because this is more than just a job to them. We are passionate about safety, and that is our highest priority in every Stockton business we service. Our family-owned and run business has never lost its passion and our desire to keep learning and improving. We have been in business for more than 35 years with the highest commitment to the Stockton customer’s we serve. The pledge of AAA Fire Protection Services is that we are always here to protect your industrial operation, commercial kitchen or restaurant.